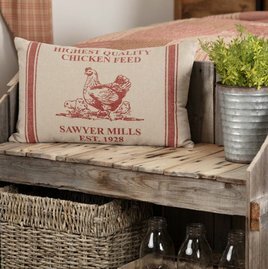 Bring a touch of farmhouse style home with the Sawyer Mill Red Hen and Chicks Pillow. Features a stenciled chicken with the words "Highest Quality Chicken Feed" and grain sack stripes down both sides. Measures 14" x 22". 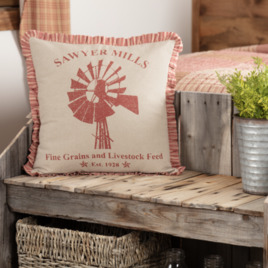 The Sawyer Mill Red Family Pillow is the perfect addition to your farmhouse style home. 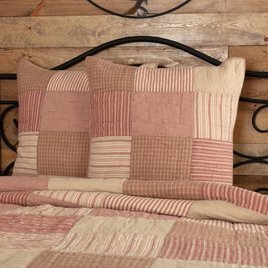 Featuring strip patchwork on the front in alternating Country Red, Dark Tan, Dark Creme fabrics containing the word "Family" appliqued in matching country red felt. 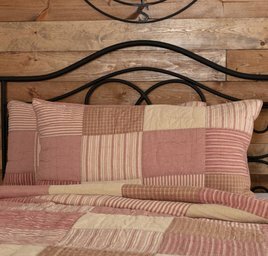 The Sawyer Mill Red Standard Sham features a simple block pattern in colors of Country Red, Dark Tan, Dark Creme. Trimmed a.5 bias cut of cream and creme micro plaid. Reverses to dark creme and red grain sack stripe and 3 tie closures. The Sawyer Mill Red Windmill Pillow brings Farmhouse style to any room. With the red stenciling this all cotton pillow is a khaki chambray and trimmed with a 1 inch red and creme striped gathered ruffle & reverses to solid khaki chambray, 2 tie closures. 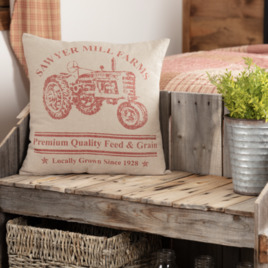 Add a touch of timeless charm to your cozy home with the Sawyer Mill Red Tractor Pillow 18x18. Featuring a distressed red tractor surrounded by "Sawyer Mill Farms" writing in red on a tan background finished with button closures on the reverse. The Sawyer Mill Red Farmhouse Pillow brings a touch of simple country to your home. The large FARMHOUSE & grain sack stripe above & below the wording, stenciled in distressed black, across the center. Reverses to red & creme striped & 2 button closures.